Dhaka, Mar 28 (Just News): BNP Chairperson Begum Khaleda Zia was not taken to a Dhaka court from jail today as she was ill. Meanwhile, Judge Md Akhtaruzzaman of the Special Judge Court-5 fixed April 5 for holding arguments in the Zia Charitable Trust case for which Khaleda Zia was supposed be taken to the court. 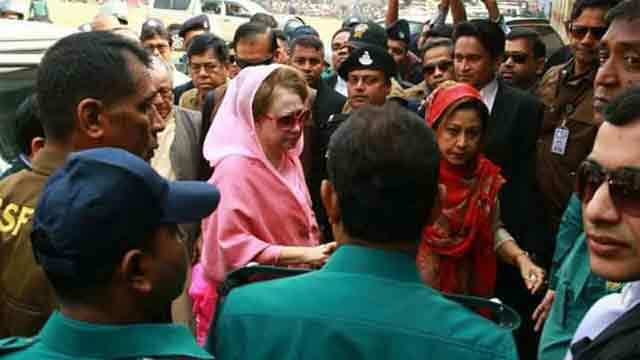 Khaleda ia was scheduled to be taken to a makeshift court in Bakshi Bazar area of Dhaka where the trial of Zia Charitable Trust corruption case has been taking place against her. Aminur Rahman, additional deputy commissioner (prosecution), posted at the Chief Metropolitan Magistrate’s (CMM) Court of Dhaka confirmed it this morning. The Anti-Corruption Commission (ACC) filed the corruption case with Tejgaon Police Station in August 2011, accusing Khaleda Zia and three others of abusing power to raise funds for the trust from unknown sources. On March 13, Special Judge Court-5 issued a production warrant against Khaleda asking the jail authorities to produce her before it on March 28-29 in the case. Khaleda Zia landed in jail on February 8 as a Dhaka court found her guilty of misappropriating a donation fund for the Zia Orphanage Trust. On Monday, the Supreme Court stayed the High Court order that granted her four months’ bail in the case, which saw her sentenced to five years’ imprisonment. She is now facing a total of 34 cases.